Nelson Piquet won on home soil in Brazil to start the 1983 World Championship, in a year when the Cosworth-DFV engines were still, just, able to be competitive against the turbos. It was also a season in which refuelling pit stops were commonplace after Brabham had trialled them at the end of 1982. The perils of refuelling at speed were immediately apparent when Keke Rosberg suffered a flash fire as fuel seeped out of drill holes in his Williams. He was unhurt as he rapidly leapt out of the car and the fire extinguished. Although he jumped back in and resumed the race in ninth, eventually finishing second, he was subsequently disqualified after stewards ruled his car had received a push start before the resumption. It was not the most auspicious start to his title defence. Up to then his weekend had gone well. He took pole and led off the line from Alain Prost's Renault, with Piquet hard on their tails. Prost was unable to hold on to second, and on the seventh lap Piquet also passed Rosberg. John Watson, who had run Rosberg to the last race in 1982, moved into third as Prost struggled with tyre vibrations. Piquet led Watson until the McLaren's engine broke leaving him free to pit without worries. A 16.4 second stop allowed Piquet to motor towards victory with Rosberg some 21 seconds behind and Niki Lauda in third. Despite Rosberg's disqualification, Lauda was not promoted so second place was left vacant, meaning only five drivers scored points. 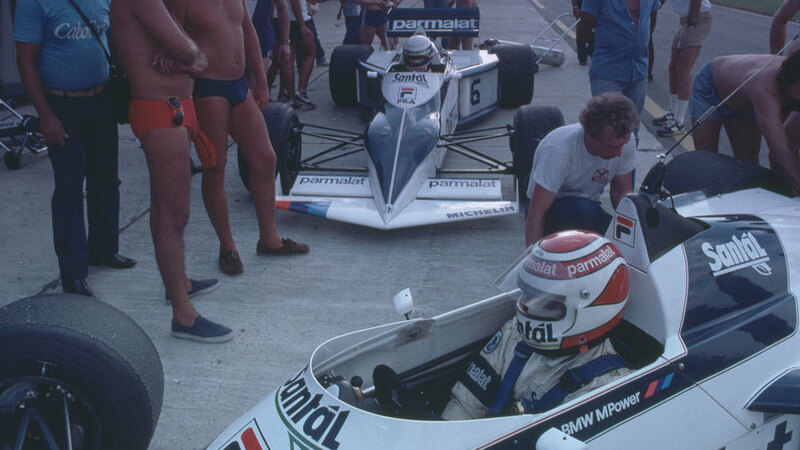 Piquet's win, a year after victory had been snatched from him by stewards when his car was found to be underweight, was remarkable in that two of the three Brabham BT52s in Brazil had not been driven before arriving at the circuit.